Take a 1-hour guided walk with Houston Ghost Tour as you uncover Old Town Spring's ghostly past. Find out eerie mysteries and sinister stories that are rich within Spring's haunted history. Discover why Houston Ghost Tour is the number one Haunted History tour that Spring has to offer. This tour can accommodate almost any party size you would like to bring. Join us for some of the most evil, dastardly, and disturbing tales that we’ve been able to collect throughout Spring’s rich history. Walk through the quiet yet noisy streets of this Old West town, where the dead never seem to rest. Ghostly history, fables, and tales – the list is long, and we’re dying to tell you! The strangest things happen after dusk every day. The shop owners throw up their “closed” signs, and hurry out of town as fast as they can. Some seem to lose their minds, become violent and angry, or completely vanish, never to be heard from again. And by the time our tour starts, we are the only people walking around in what becomes a literal Ghost Town. Our Spring tour starts in front of a shop called Sedona Joe's, located at 311 Main Street, Spring, Texas. Join us today and feed your curiosity! 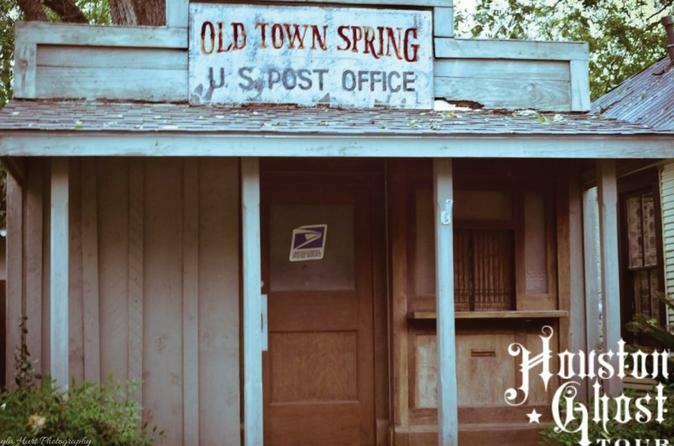 A 1 Hour guided Ghost Tour of Old Town Spring, Texas. Our Tours are a ghost story for you to experience first hand! Travel to a haunted town and listen to your entertaining tour guide as they guide you to each haunted stop. Follow your guide through archways, down dark paths, and over old wooden bridges to the paranormal beyond. Water bottles, your camera (cell phones work fine! ), and/or an umbrella if it may rain. Please wear comfortable clothing, as we will be outside the entire time. We walk through dirt and gravel pathways, and may encounter mud puddles along the tour route. Please wear comfortable shoes that you don't mind getting wet. Please bring bug spray with you if you can, as Texas is notorious for mosquitos! There are no restrooms provided on tour unless the local theater is having a show. In that case, we will be able to stop for a bathroom break. It's best to plan ahead and use the restroom before you come to the tour location.